8x8 Awarded 2014 North American Hosted IP Telephony and UCC Services Customer Value Leadership Award | 8x8, Inc.
8x8 offers one of the most comprehensive hosted communications feature sets that addresses the needs of a diverse customer audience. 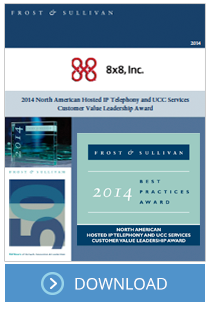 Based on its recent analysis of the hosted IP telephony and Unified Communications and Collaboration (UCC) services industry, Frost & Sullivan recognizes 8x8 with the 2014 North America Frost & Sullivan Award for Customer Value Leadership. 8x8 ranks the highest in customer value due to its broad cloud communications services portfolio, high service reliability and security, tight focus on customer experience, global presence and low costs. Unlike many of its competitors, 8x8 leverages a patented, home-grown platform that enables it to rapidly and economically innovate. It offers an extensive set of hosted communications and collaboration applications that rivals the capabilities of premises-based UCC solutions and is counted among the most compelling hosted communications solutions. In addition to a standard set of private branch exchange (PBX) functionalities, voicemail and unified messaging, 8x8 also includes instant messaging (IM) and presence, conferencing, soft clients, mobility, SMS, contact center and video conferencing in its bundled offerings. Other features include the ability to integrate distributed enterprise locations onto a single virtual PBX, while allowing each to operate autonomously, thus facilitating system administration and enabling disaster preparedness/recovery. Significantly, 8x8 caters to a growing customer need to support mobile and remote workers. In addition to its Virtual Office mobile app for iOS and Android devices, it introduced white-boarding and file-sharing capabilities, and continually enriches its virtual meetings product to facilitate collaboration across geographically distributed teams. Apart from product features and functionality, 8x8 has demonstrated a keen desire to ensure service reliability and security. It delivers its hosted communications solutions using two fully mirrored and geographically redundant data centers in Santa Clara, Calif., and Ashburn, Va. 8x8 service-level agreements (SLAs) guarantee four-nines (99.99 percent) uptime; however, it outperformed its own standards over the past two years with uptime of nearly five-nines (99.997 percent). 8x8 services also support a wide array of critical security and compliance requirements, including HIPAA/HITECH, FISMA, CPNI, FIPS and PCI-DSS. 8x8 conducts gap analysis based on security requirements to ensure compliance with various industry regulations. For example, from a HIPAA compliance point of view, 8x8 has 141 controls in place related to audit and accountability, contingency planning, etc. 8x8 is continually improving its customers’ deployment, onboarding and service management experiences. For instance, it launched a major Big Data initiative, whereby at the end of each call, the endpoints publish data to its Big Data environment for better assessment of current and potential service-related issues. This allows 8x8 to proactively identify, isolate and resolve potential threats to the network before customers experience degraded service. 8x8 is one of the top two hosted IP telephony and UCC service providers in North America in terms of installed users and revenues. Its installed base of hosted IP telephony and UCC users grew steadily to touch 361,000 users in 2013, which is a 24 percent increase over 2012. A key factor in 8x8’s customer acquisition success is its increased focus on larger accounts and, more specifically, the mid-market. One of its strongest assets in delivering services to larger organizations is its contact center business, which adds value and differentiates the company from most of its competitors. As contact centers receive more complex inquiries, agents can leverage advanced UCC tools to reach out to subject matter experts to close deals or solve problems. 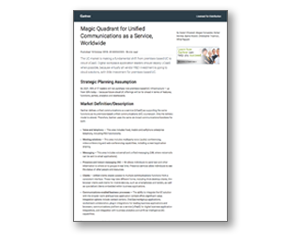 By having strong hosted UCC and contact center solutions 8x8 is able to successfully bridge these conversations. Moreover, 8x8 added capabilities specifically targeted at distributed organizations. Now a single hosted PBX can elegantly manage multiple locations within the customer’s organization. 8x8’s solution ties all of a customer’s sites with a single auto attendant, while deploying separate receptionist lines at each location. The solution also provides an advanced routing functionality to multi-location customers. 8x8’s broad appeal to a diverse customer audience is also boosted by its ability to meet critical industry-specific security and compliance requirements, including FISMA, CPNI, FIPS, PCI-DSS, HIPAA and HIPAA/HITECH. 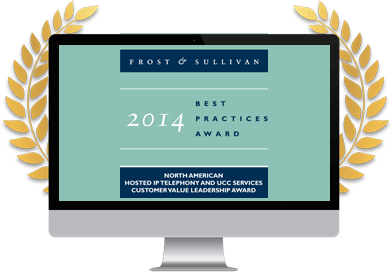 Each year, Frost & Sullivan presents this award to the company that has demonstrated excellence in implementing strategies that proactively create value for its customers with a focus on improving the return on the investment. The award recognizes the company’s focus on enhancing the value that its customers receive, beyond simply good customer service, leading to improved customer retention and, ultimately, customer base expansion.